Another one of my favorite photographs from an iconic NYC location...The New York Library building. 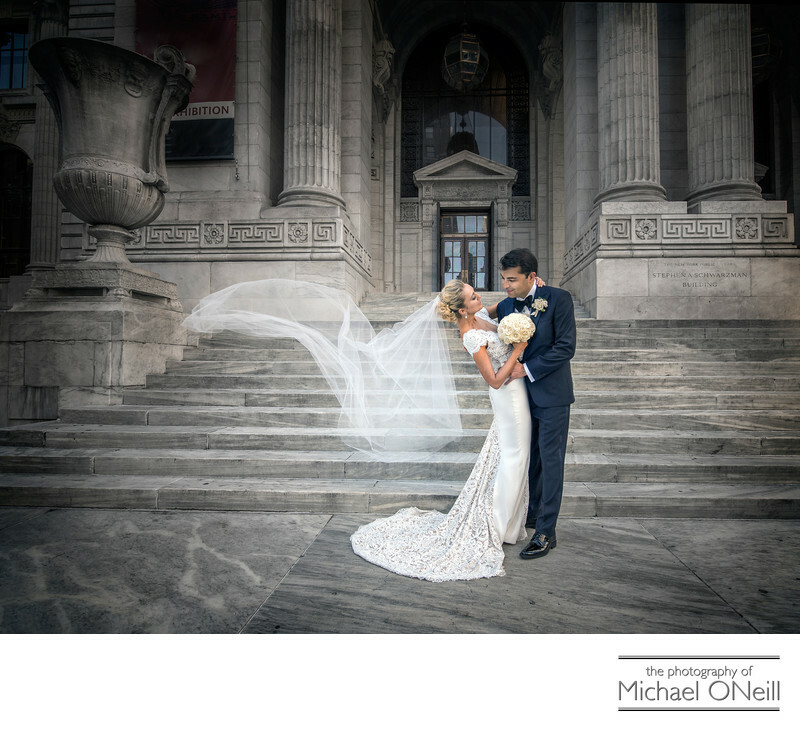 The bold architecture serves as an elegant backdrop to this playful, candid wedding photograph. The effect of the bride’s cathedral length wedding veil blowing in the wind is just that...an effect. As organic and natural as it looks it takes the work of an experienced photographic assistant to get the bride’s veil flying just so. When interviewing photographers to be entrusted with capturing all of the precious memories of your big day be sure to question them about their assistant’s experience. My current assistant has been with me for over eight years and knows what I’m going to do before I actually do it. That kind of teamwork is essential to creating great wedding pictures. I love working closely with my team to create awesome images for my clients. As you look around this web site you will find numerous pictures taken at this legendary New York City building. The hardest part about shooting at this popular NYC gathering place is getting the shot without a hundred pedestrians in the background. Part of this can be solved through the miracle of Photoshop but mostly it is because my assistant has the skills and charm to speak to the people and ask them to do what most New Yorker’s will do...cooperate and welcome the people of their city to enjoy it as much as they do. Be prepared to spend a few moments accepting their congratulations.